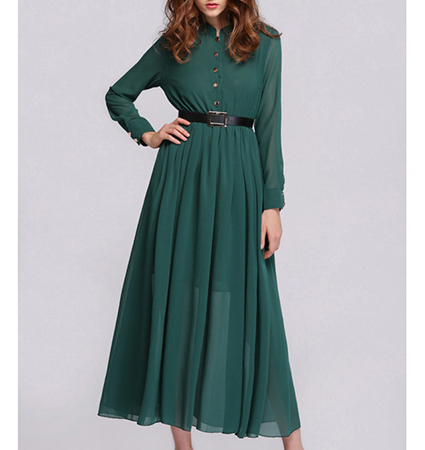 This is a beautiful women’s chiffon midi dress that is suitable for virtually any semi-formal occasion. It is presented in a lovely shade of emerald green and is fully lined. The outer layer is a very high quality, semi-sheer chiffon. The bodice of this dress is expertly fitted and buttons with glistening decorative buttons. It features a high neckline and a small stand up collar. The waist is defined by a black belt with a pretty silver buckle. The skirt portion of the dress is nice and full. The hemline ends at the mid-calf area of the leg. We recommend dry cleaning only for this dress. It is available for purchase in sizes Small, Medium, Large and Extra Large.